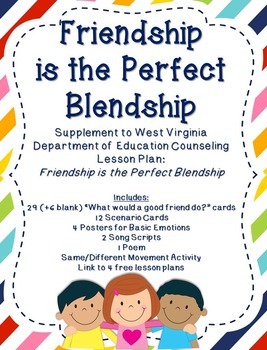 This is a supplemental set for the four lessons entitled "Friendship is the Perfect Blendship" from the West Virginia Department of Education School Counseling Curriculum. -How Does a Friend Act? : Students will be able to interact with others in ways that respect individual and group differences. -How Do I Act Like a Friend? : Students will demonstrate how to be a friend. -How We are Alike and Different: Students will identify similarities and differences among classmates. -Feeling Faces: Students will identify feelings of others.